One of the most important aspects of VR/AR production is accuracy, i.e. ensuring that the graphics are stable in the correct position relative to the set. If the tracking is not sufficiently accurate or starts to lose calibration, the graphics will start to drift and become unstable. Mechanical tracking systems (encoder technology attached to or built into camera support equipment) capture vital camera positional information such as pan/tilt, height, X,Y floor position and zoom/focus parameters. This information is merged at the SPI (Serial Position Interface) box and feeds in real time via industry standard protocol to the graphics engine. At Shotoku we have built physical position tracking encoders into most of our products – including tripod heads, pedestals, cranes and robotics, providing a very wide choice of solutions. 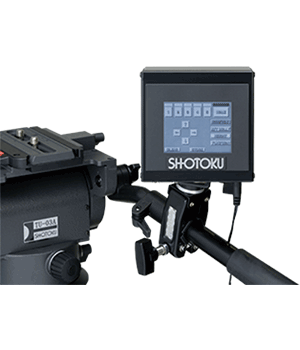 Absolute external reference systems like Shotoku’s Free-d2 consist of a small upward-facing tracking camera mounted on the main camera, looking at a set of reference markers mounted to the studio ceiling or within the lighting grid. Lens data is combined with the video image and presented to the Free-d² processor which precisely calculates the camera’s 3D position and provides industry standard, frame-synchronized tracking data to any graphics engine. Point of contrast referencing systems uses sensors attached to a camera to track features in the environment, thus providing positional information. The system needs to be able to see enough fixed points of contrast to maintain its tracking. Some systems are more suitable for certain types of projects. If you are planning a live VR production, here are some factors to consider that might influence your choice of tracking technology. 1. Studio-based or outside broadcast? Mechanical encoders and absolute systems both work well in a studio, but the latter are generally not flexible enough for location work. Instead you could use a point of contrast system; however, these systems can have difficulty performing under any change in lighting (e.g. the sun’s position changes, the sky clouds up, darkness falls during the production) making such systems less stable. 2. Green screen or hard set environment? Systems that use sensors to track features in the environment rely on points of contrast; they can struggle in a green screen environment and may need to look away from the set to find their reference. A mechanical system may work better for a green screen production. Mechanical encoding has the same cost per camera to be tracked. External tracking becomes more cost effective with multiple channels as a single installation of external targets will track multiple cameras. Obviously each camera needs a spotter camera but this is only part of the system cost. 4. Do you want to go handheld? As encoders are embedded in the camera supports, mechanical systems are not suitable if you want to go handheld. Absolute systems take their references from the spotter camera and target tracking points, so as long as the spotter camera can see the markers, the main camera can be tracked regardless of how the camera is supported. Absolute systems are by nature fixed installations and cannot be moved to another location. Mechanical equipment with built-in encoders can be moved around and set up as required. Mechanical systems by their very nature build errors over time, particularly if using pedestals prone to wheel slip on floors that are less than perfectly flat. When this happens the system needs to be recalibrated, which isn’t always easy on a live production. Speed is the key here, and Shotoku’s SPi-Touch two point calibration is one of the quickest systems around – it allows the operator to recalibrate in under a minute, quick enough to fit within a commercial break. Absolute systems very rarely drift as they do not have a mechanical interface, so they seldom need recalibration. Mechanical tracking systems output positional data in real time. Tracking delays must be considered, especially in cases such as lip-synching during a live event. To choose a tracking solution that will cover most, if not all, of your requirements, talk to a tracking system manufacturer – preferably one that offers multiple types of system so they can be flexible in their advice. Tracking is a critical component in any VS/AR system so it pays to choose the right solution.